PHILIPPE COMES FROM FRANCE TO CELEBRATE HIS BIRTHDAY! Allen and I decided to take him for lunch though he thought he was taking us after he chose the Sea Watch. In the first line of pictures there is the entrance to the Sea Watch, then Philippe and Allen, me (there was a graduation party right behind me) and the view from our window. 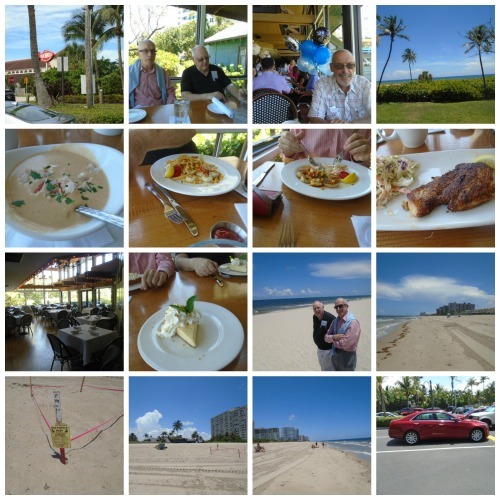 On the next line is another dining room followed by the piece of Key Lime pie we each had, Allen and Philippe on the beach, then looking east, a roped off area for turtle eggs laid on the beach, looking west, looking north and a side shot of Allen’s new car. It was nice to be with Philippe and Allen but for the second time in a row I was disappointed in the Sea Watch, particularly with the service, and the overpriced piece of fish. By the way that piece of Key Lime pie was on special—only $4 a slice! Tomorrow we will be going to the movies and then on Saturday Philippe will take us, and a friend of his who lives here, out for his birthday. I am so glad today was a beautiful sunny afternoon though the sand on the beach was hot!